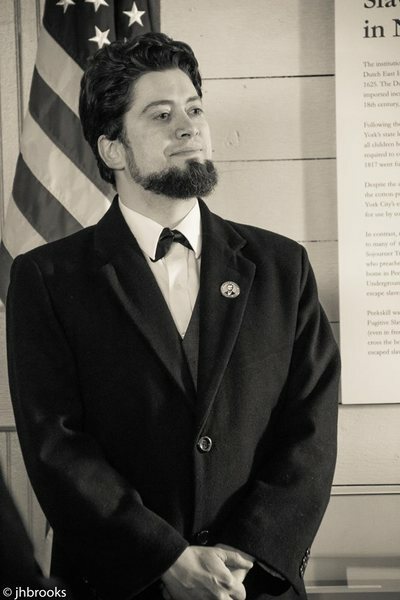 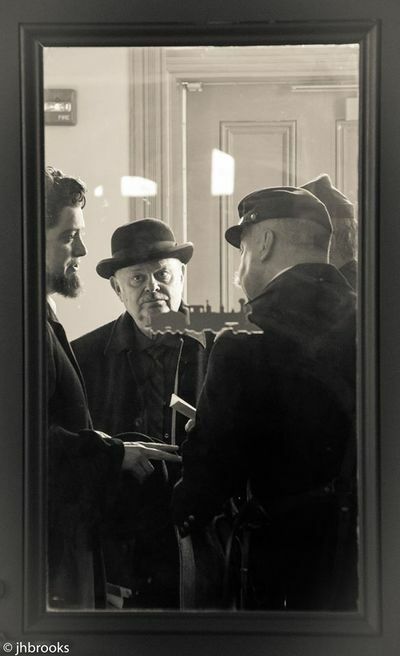 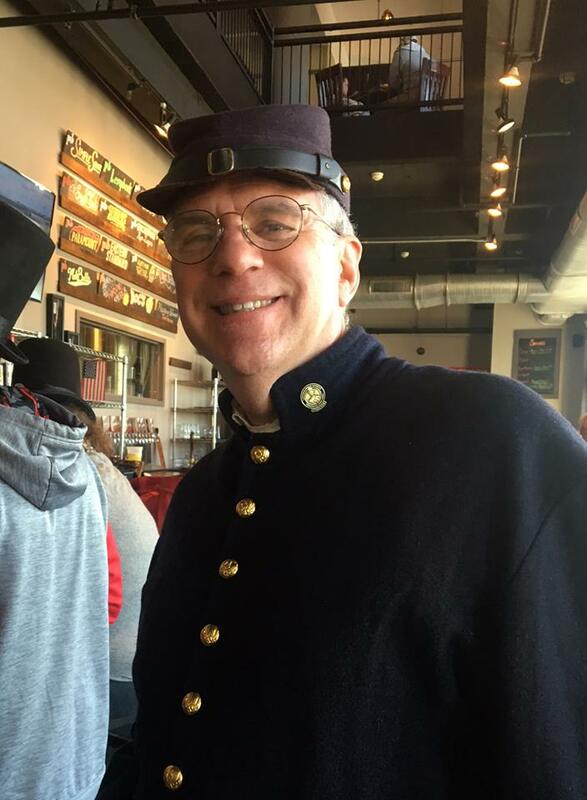 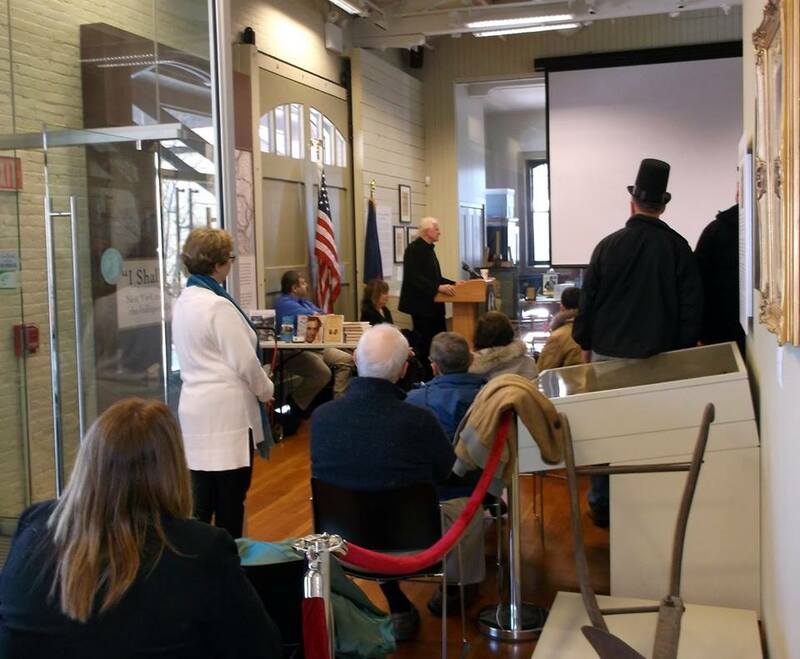 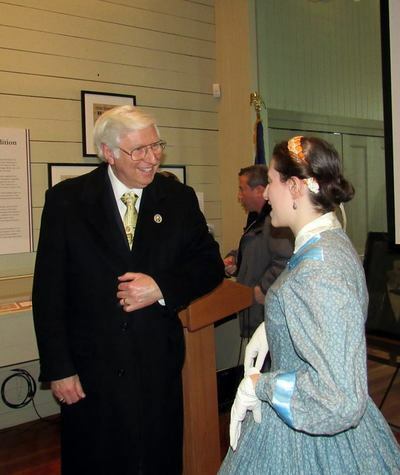 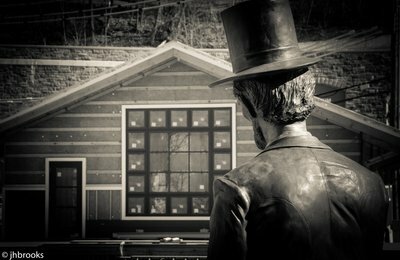 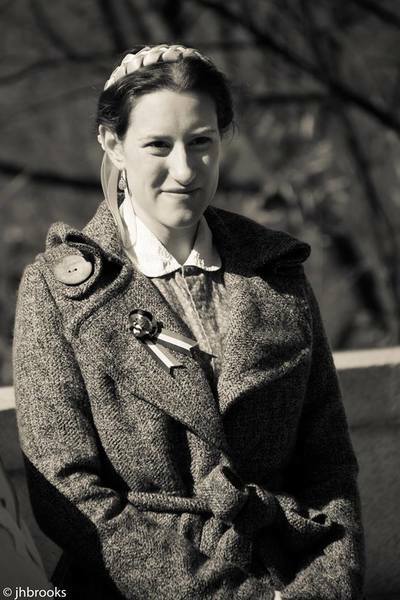 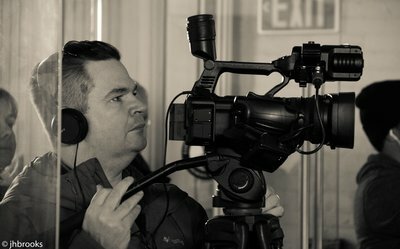 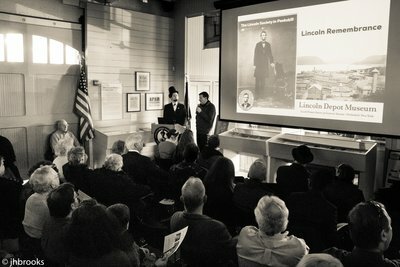 2018: Lincoln Exedra program, and speech reenactment and program at Lincoln Depot Museum. 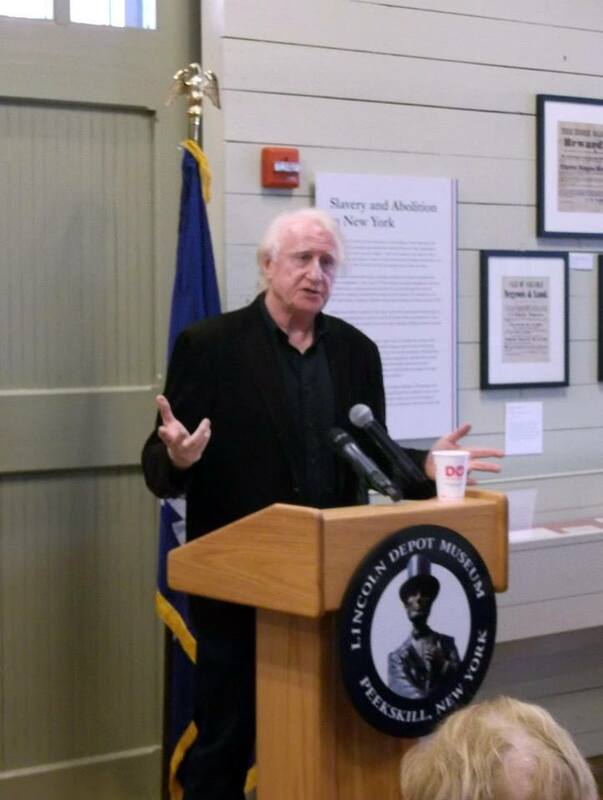 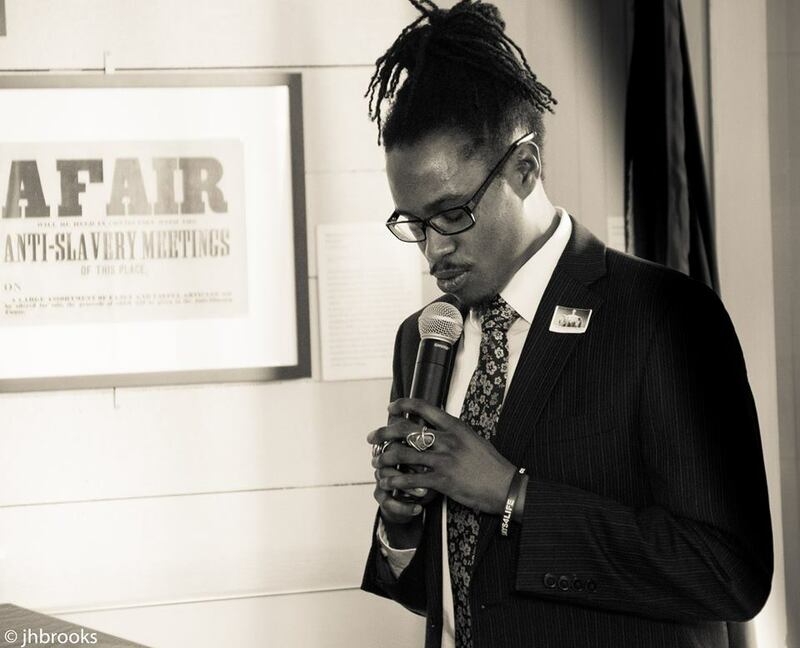 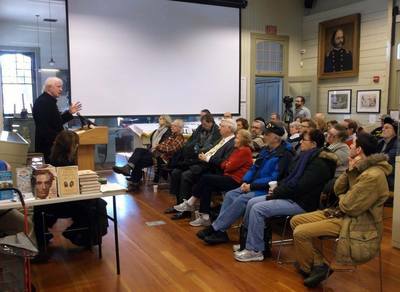 It was wonderful to celebrate Lincoln's Peekskill Speech with the Lincoln Society in Peekskill and the Lincoln Depot Museum. 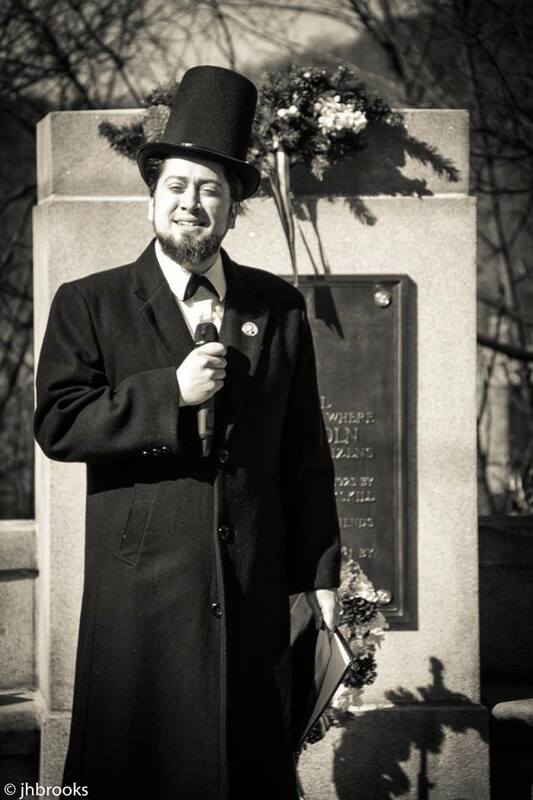 Mark Aarons recited O Captain My Captain. Alyssa Martin sang the National Anthem and the Battle Hymn of the Republic. 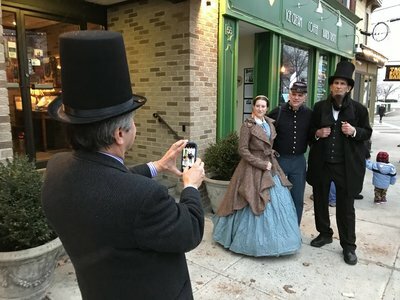 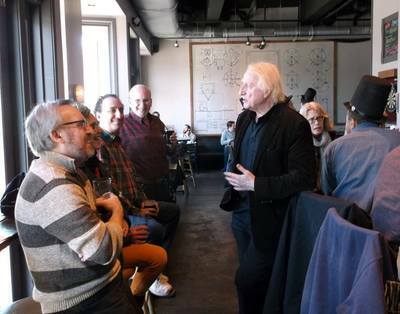 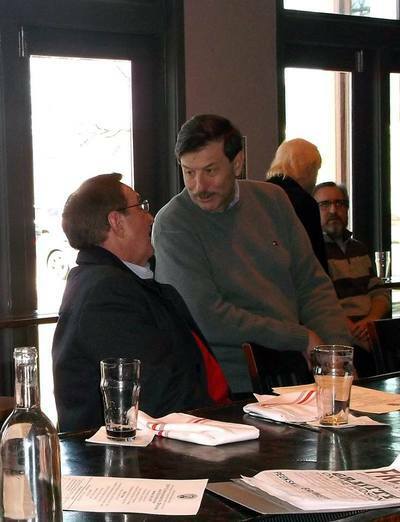 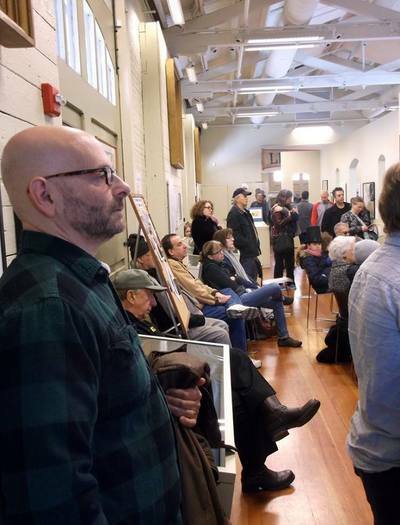 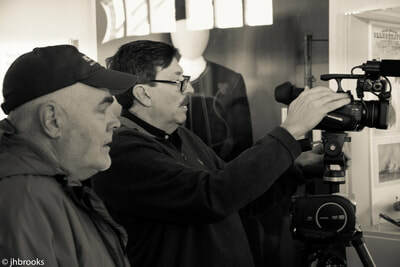 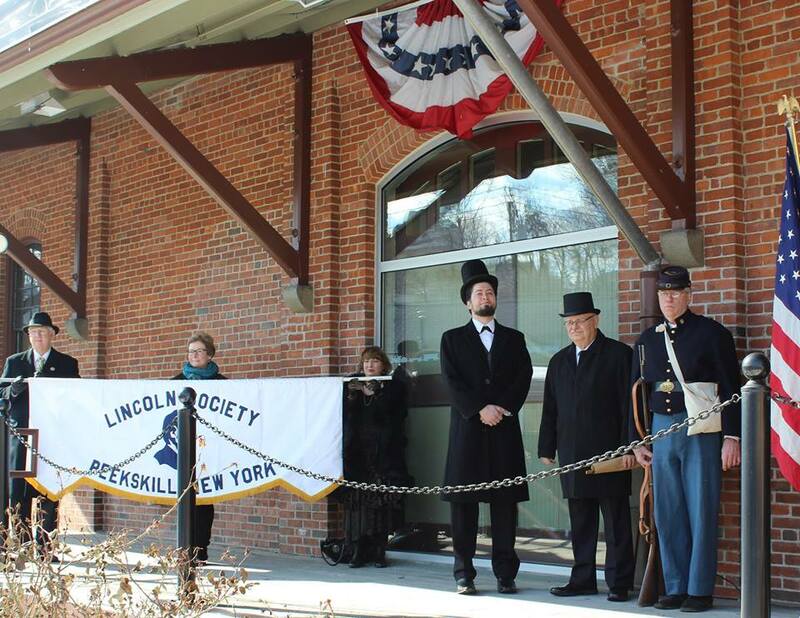 Michael Macedonia reenacted Lincoln's Peekskill Address and Frank Goderre presented a slide show of historic Peekskill. 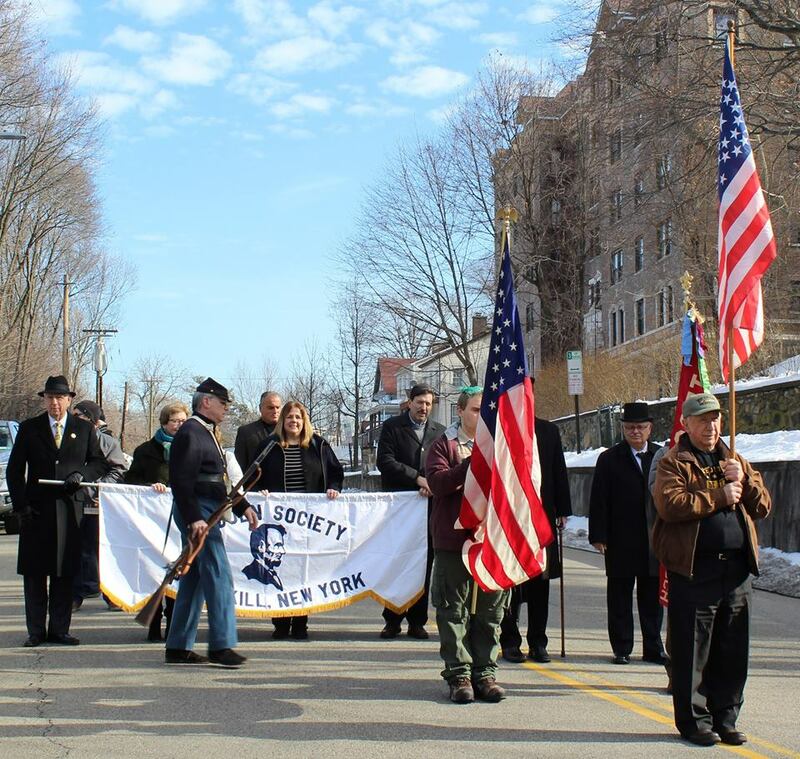 Ken Colomba represented the 15th NY Cavalry. 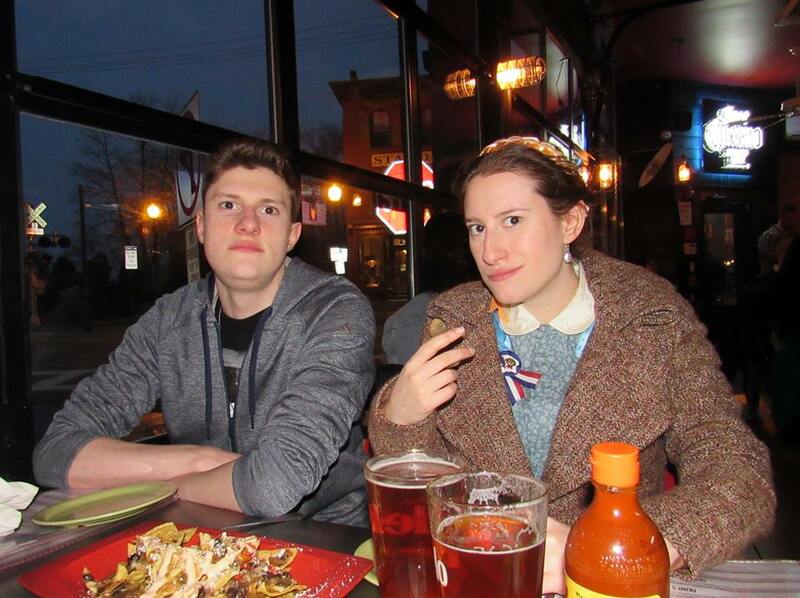 We ended with our Annual LINCON pub crawl, Drinikin with Linkin! 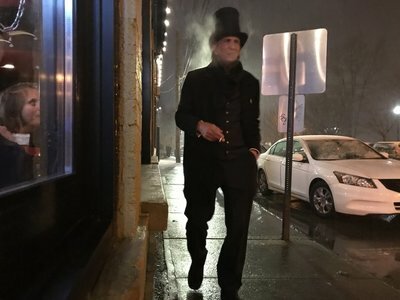 Bill Warren, A lone figure, tall and dark, walks the quiet streets. He knows the territory and has a job to finish... photo by Chris Casaburi down by the train tracks Peekskill, NY. 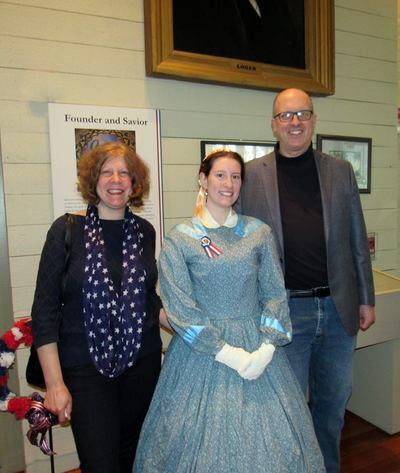 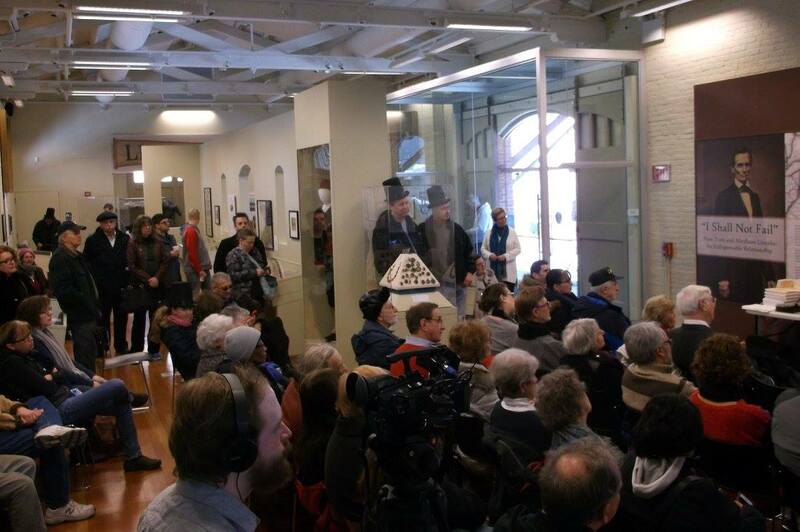 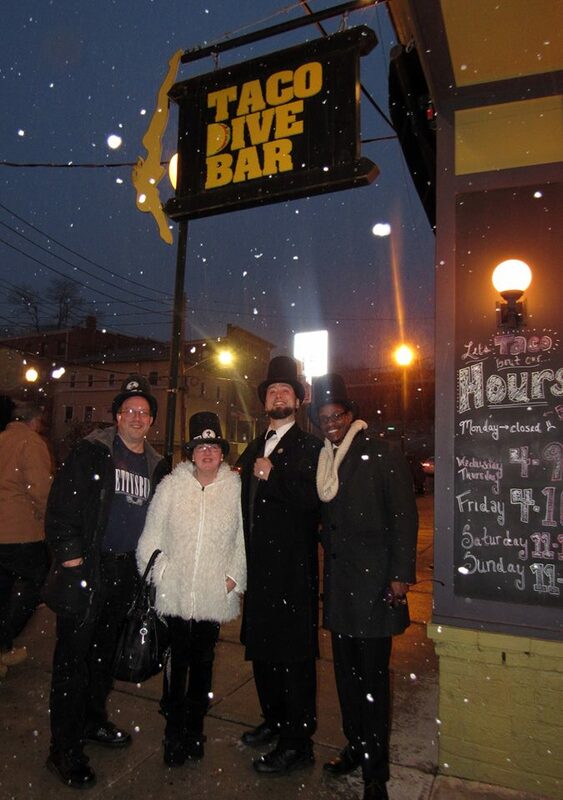 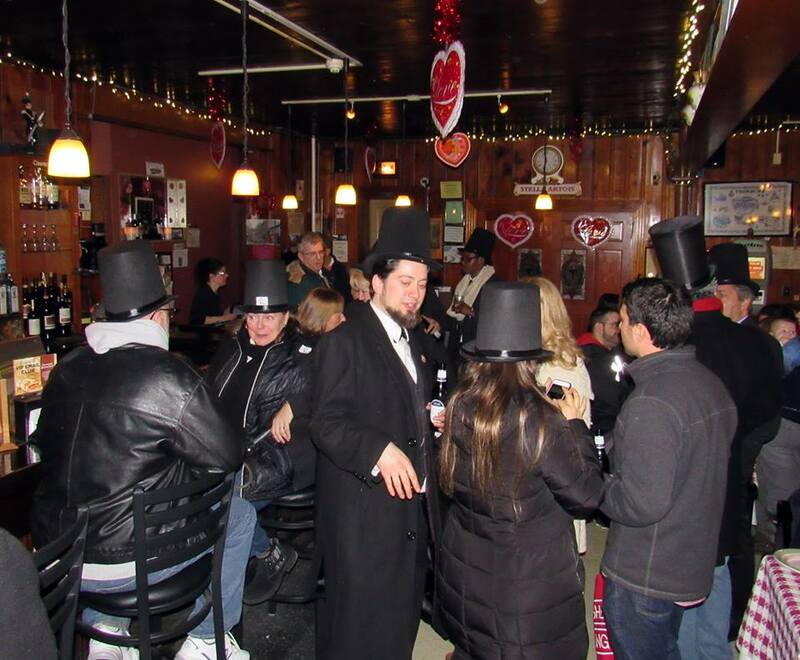 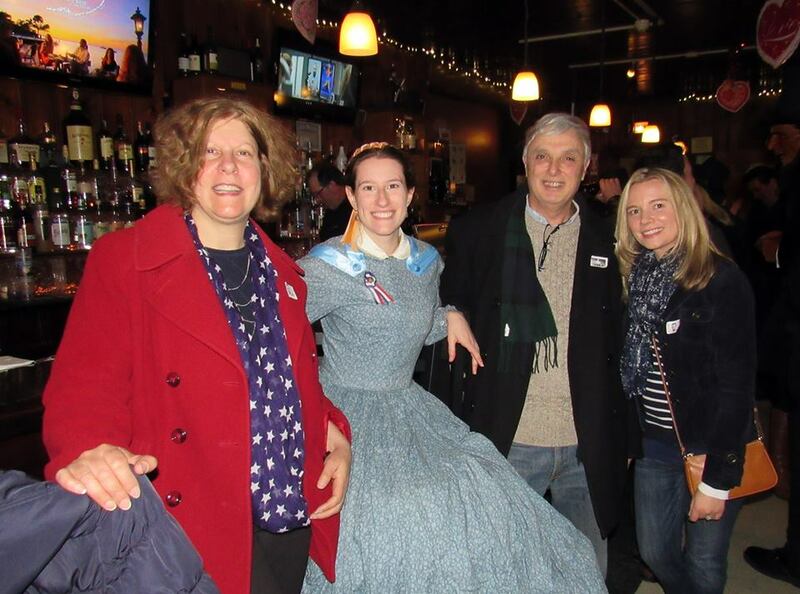 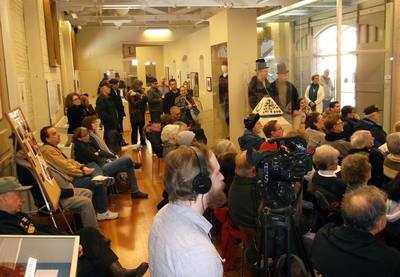 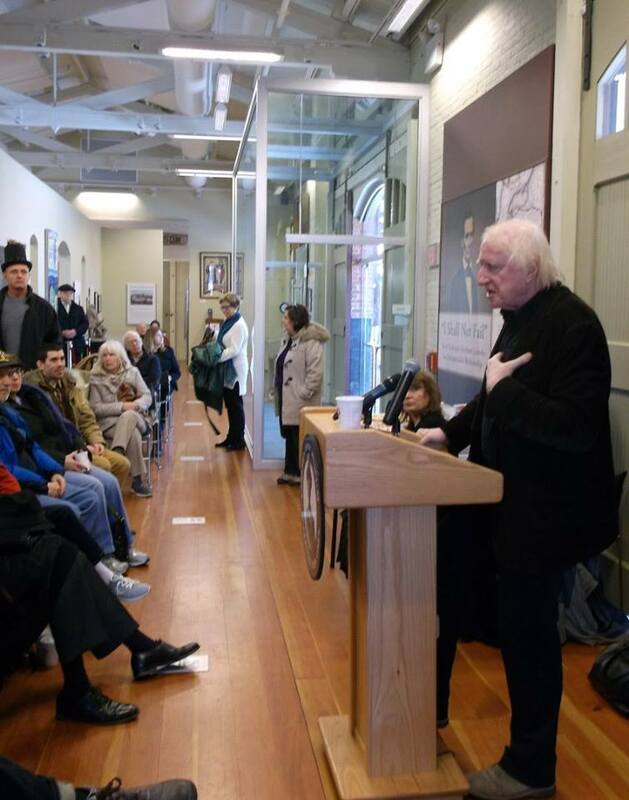 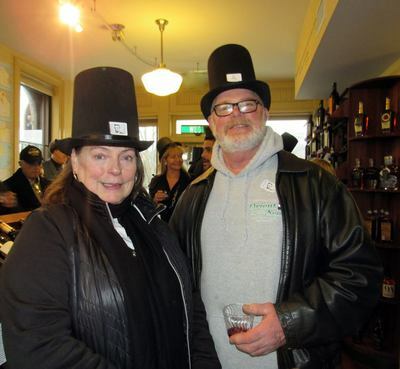 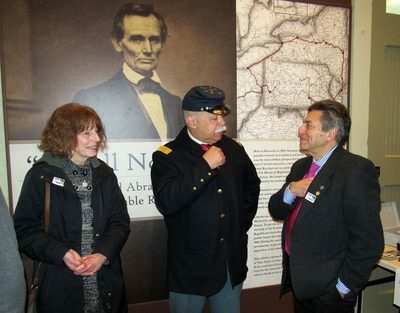 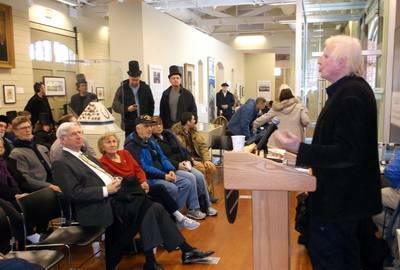 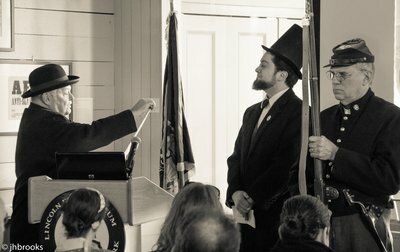 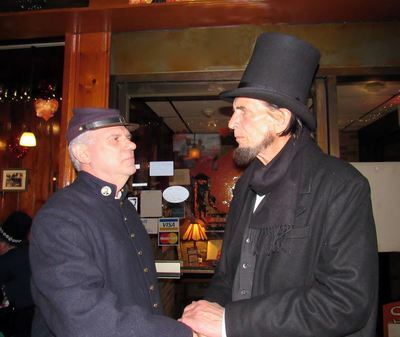 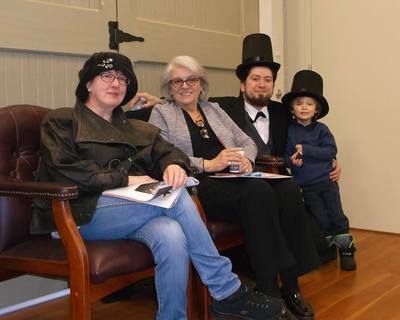 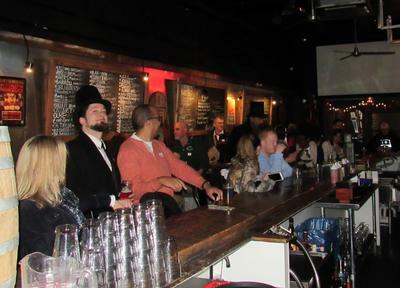 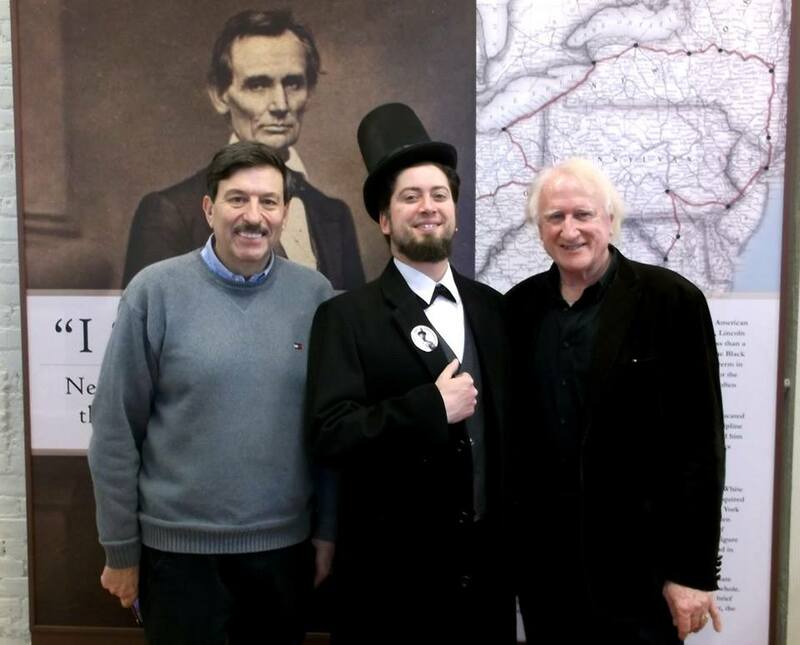 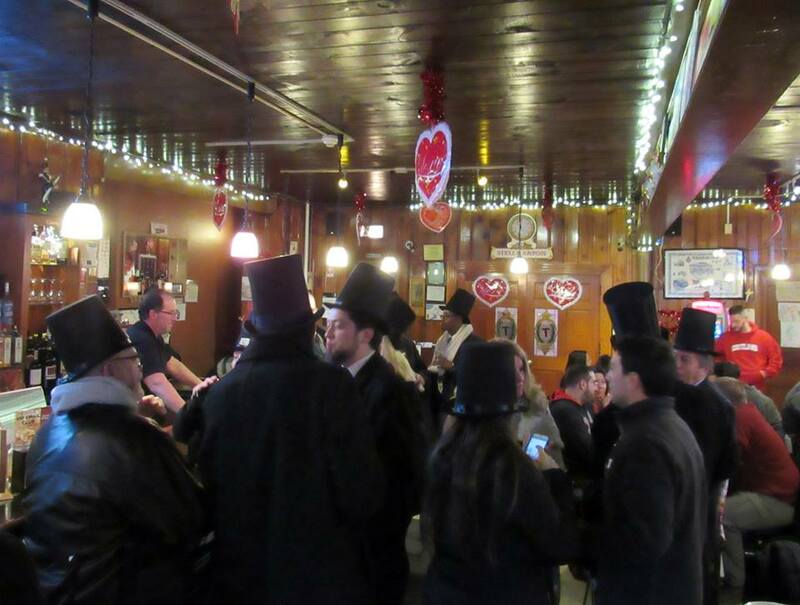 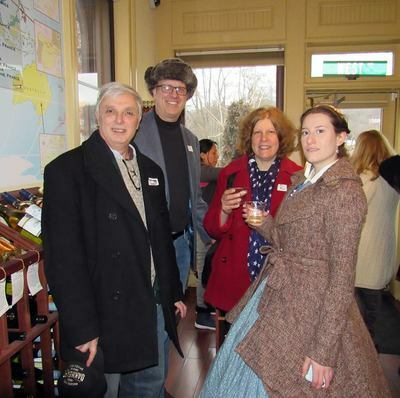 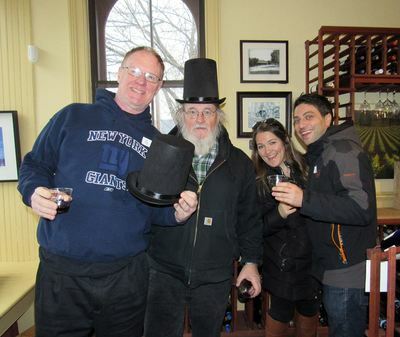 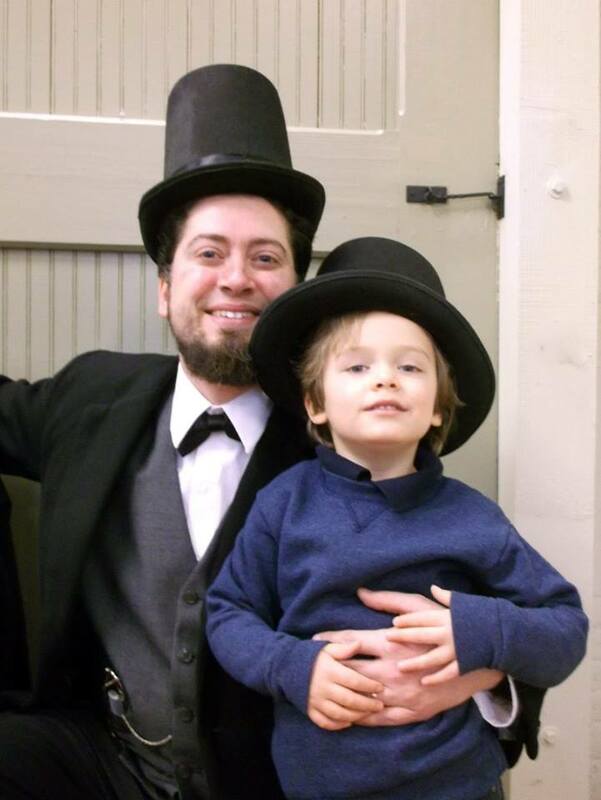 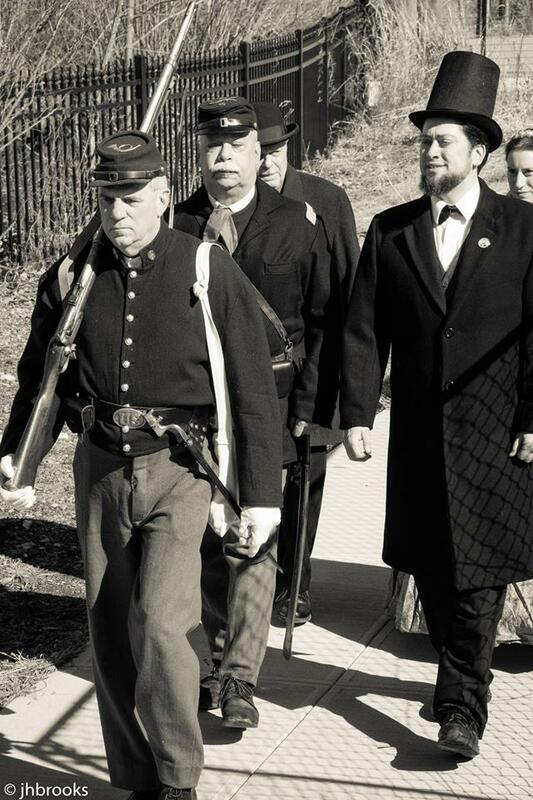 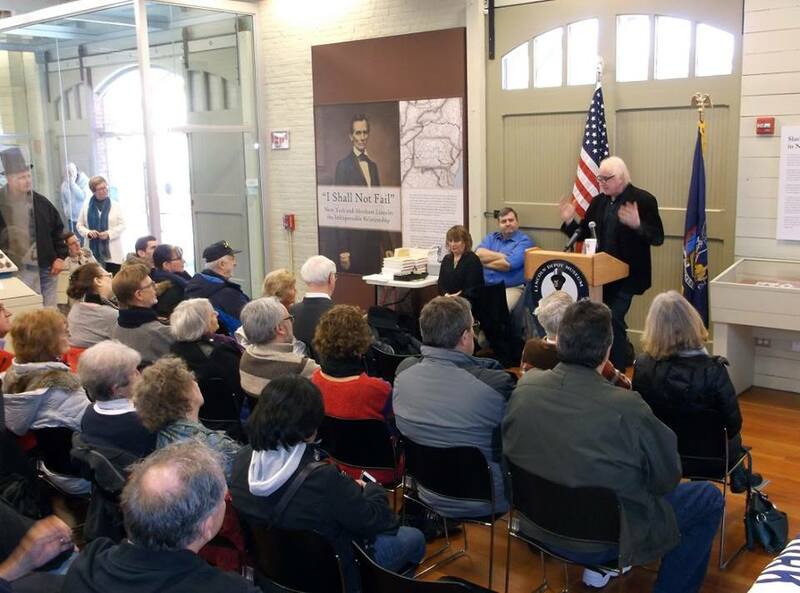 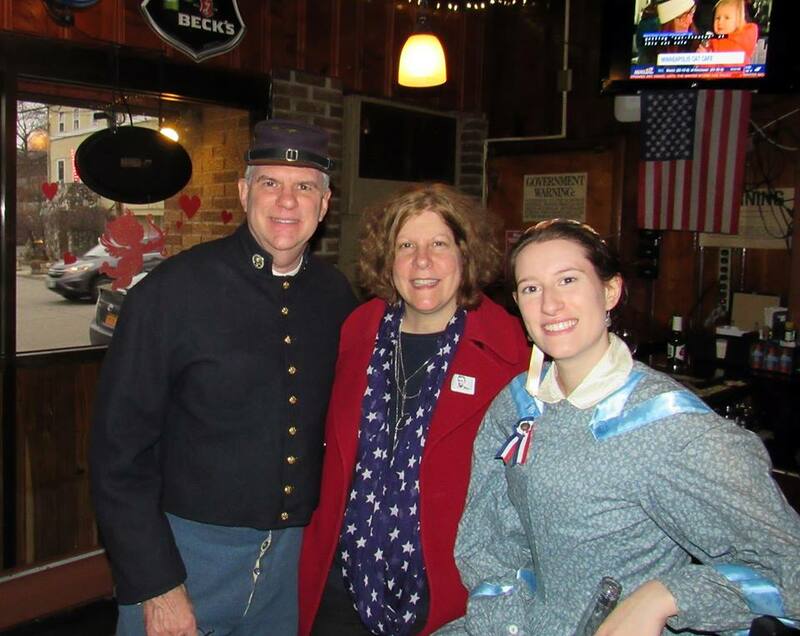 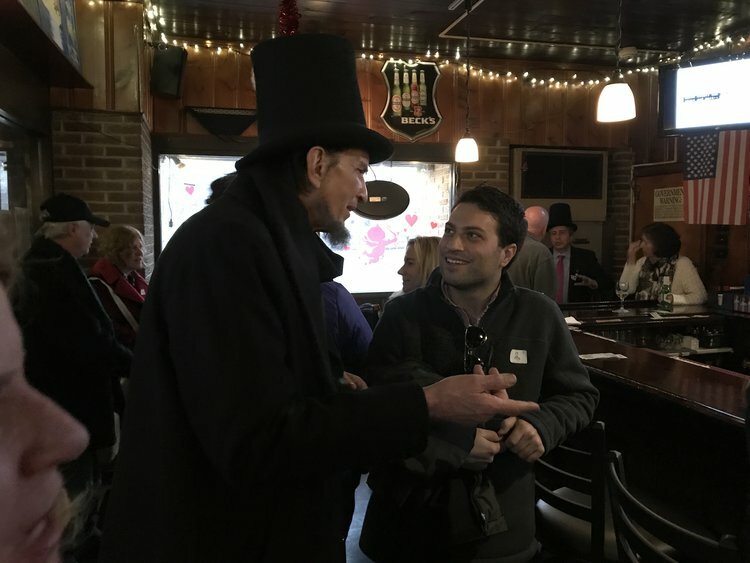 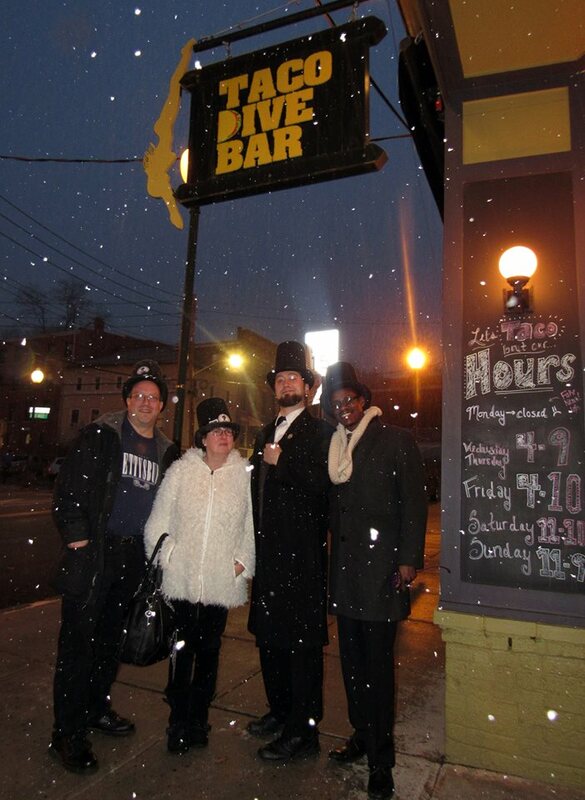 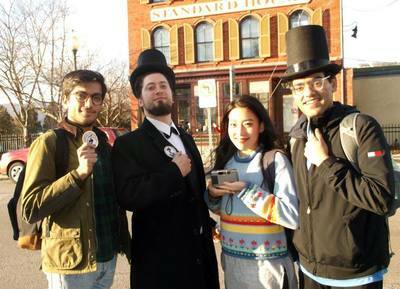 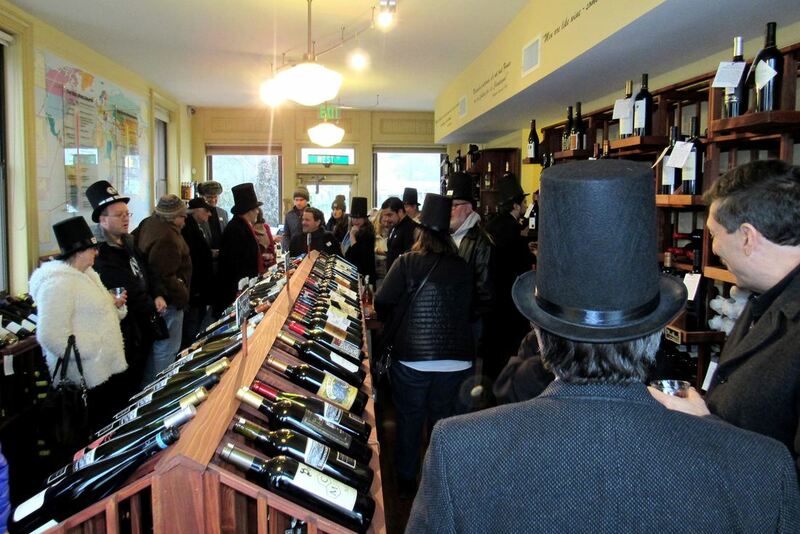 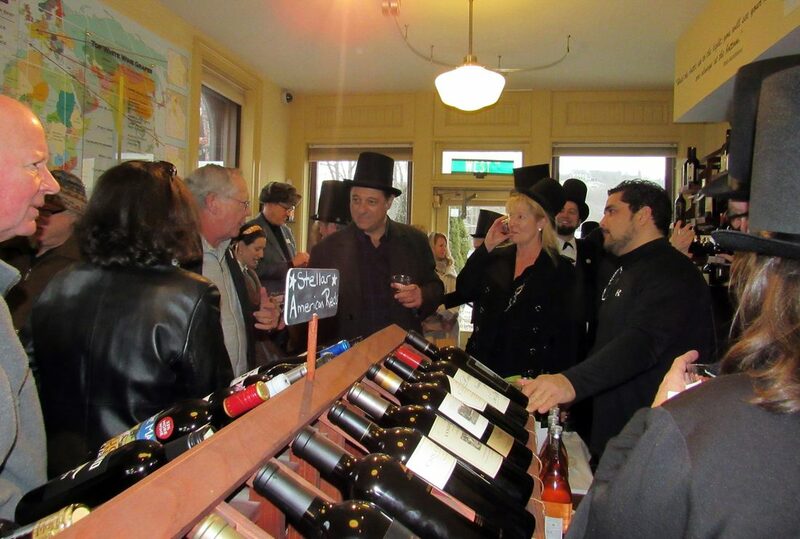 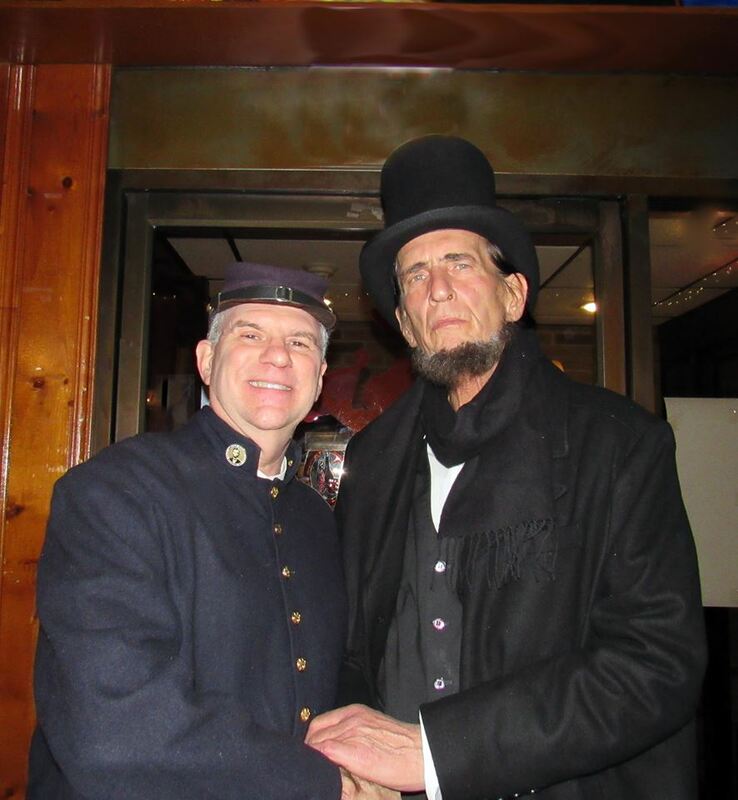 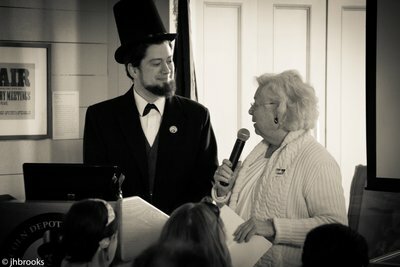 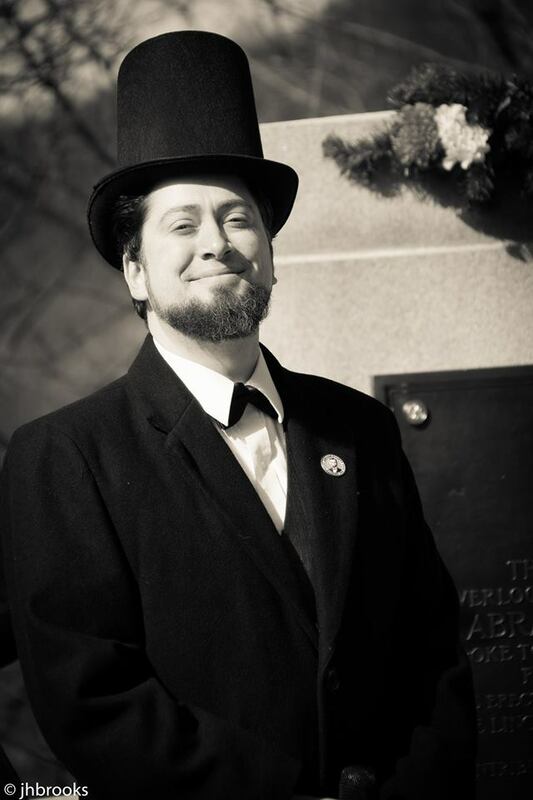 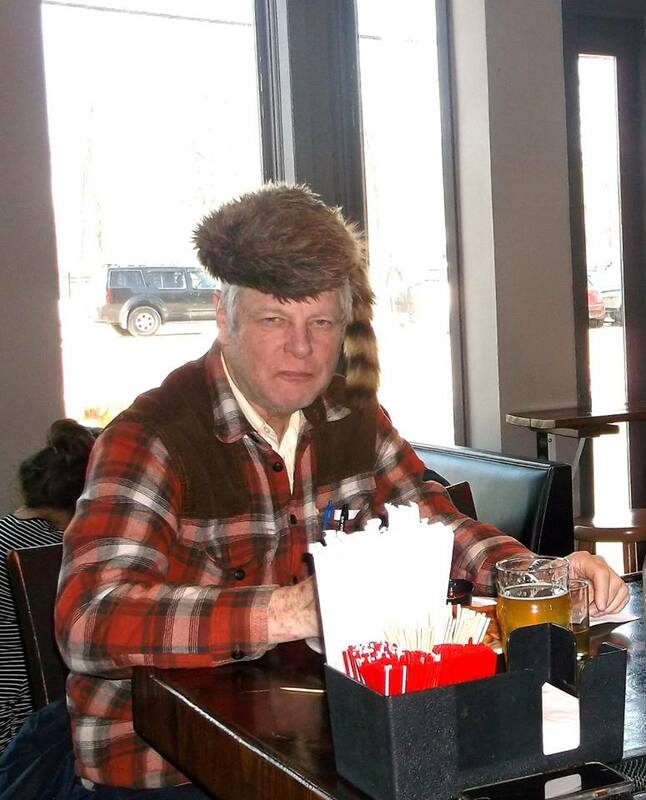 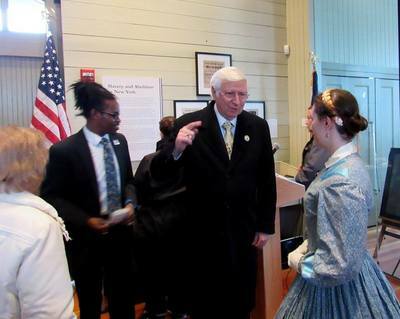 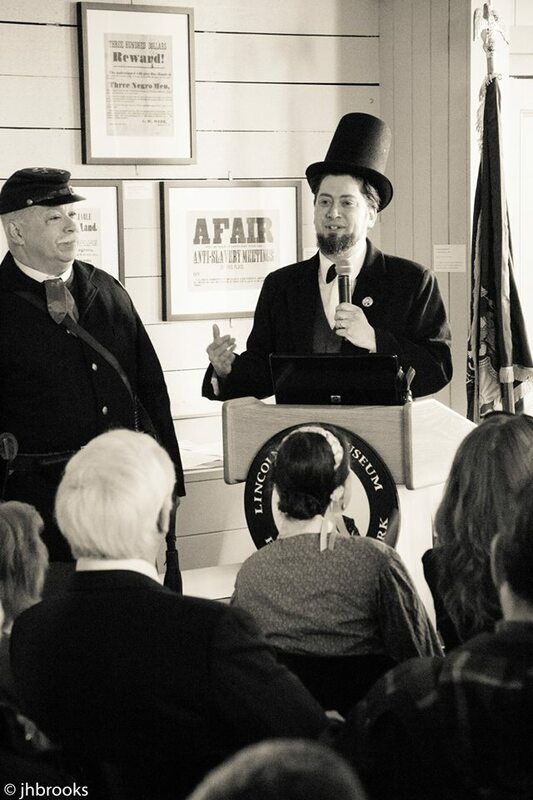 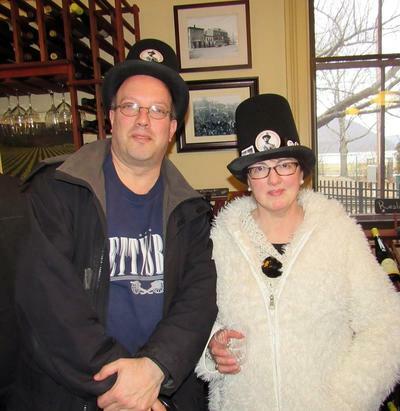 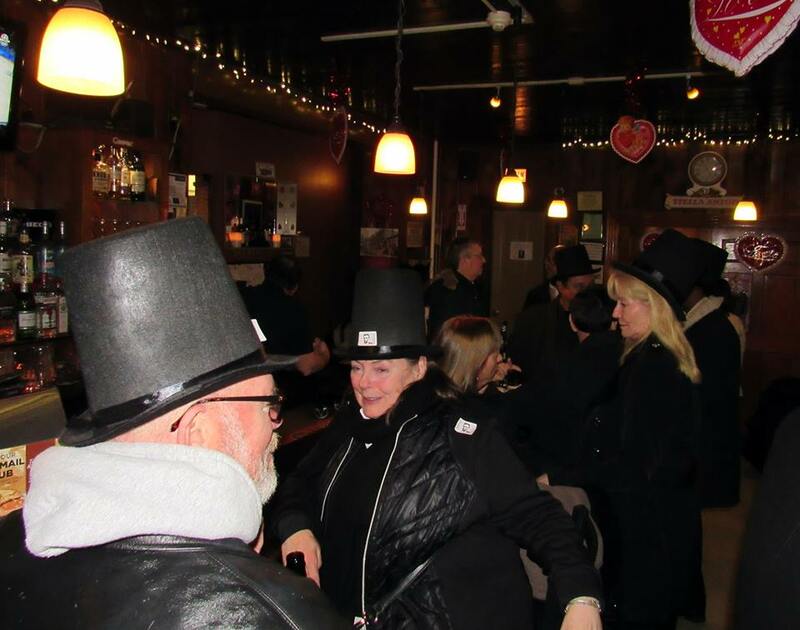 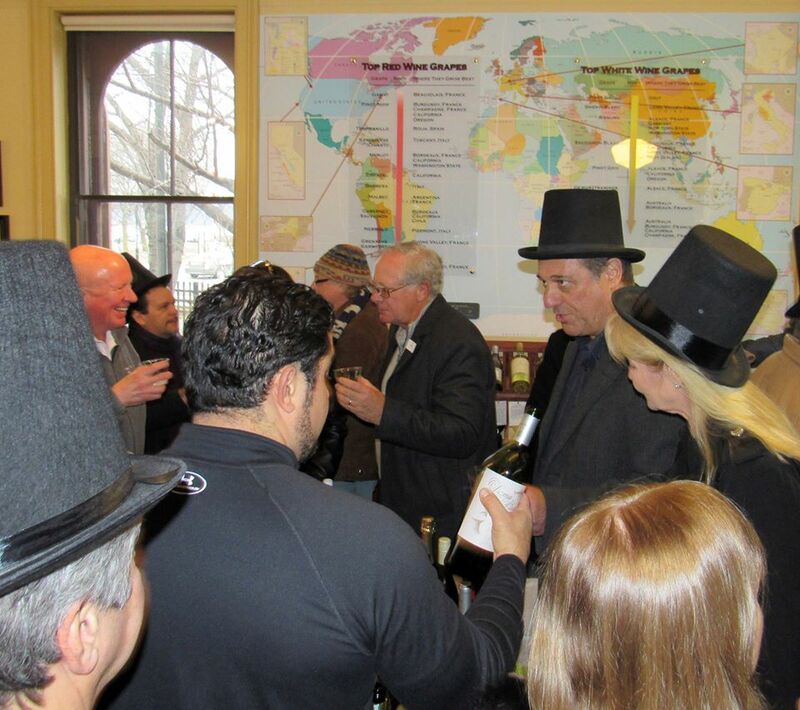 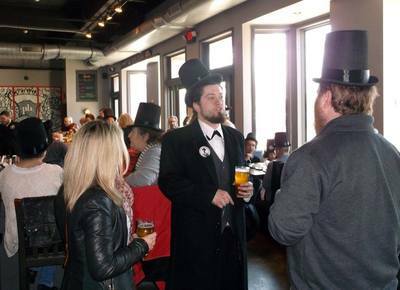 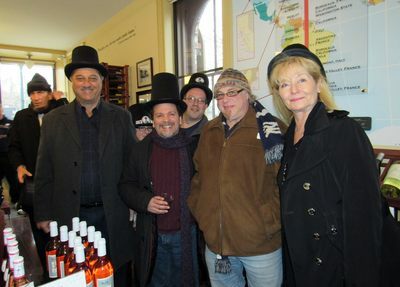 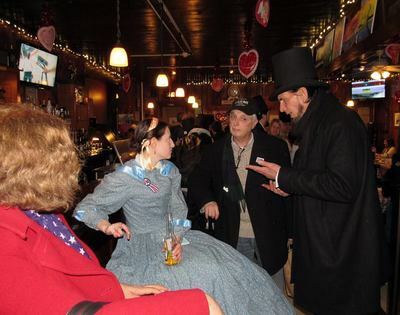 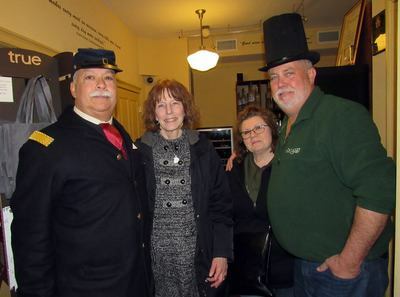 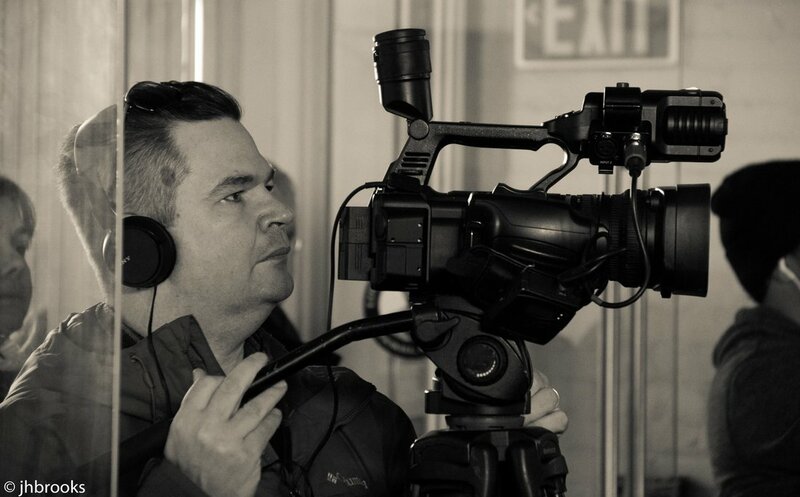 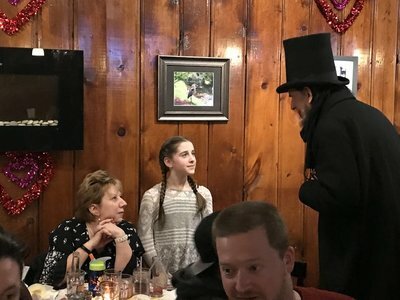 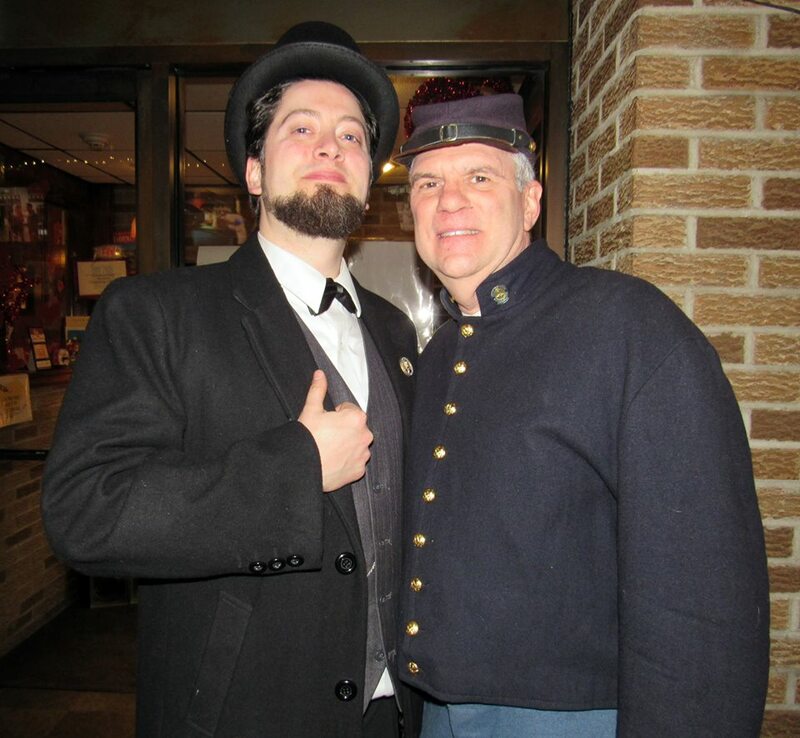 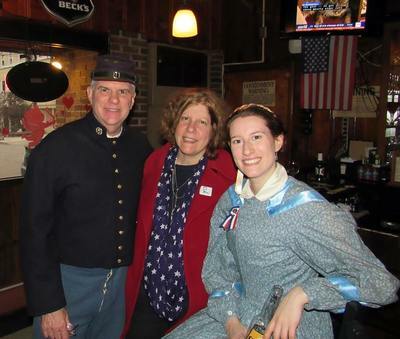 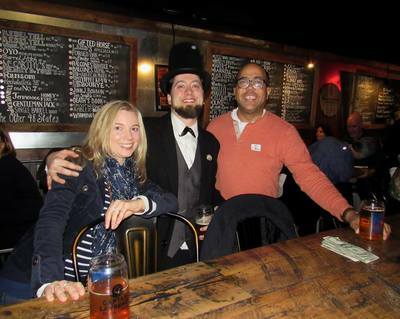 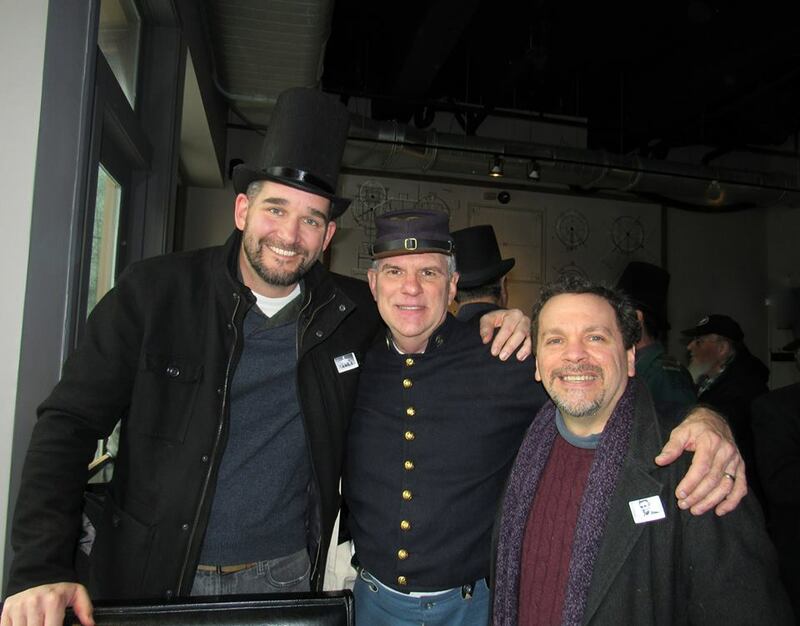 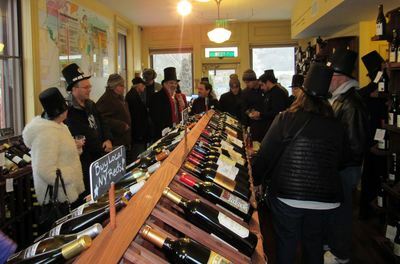 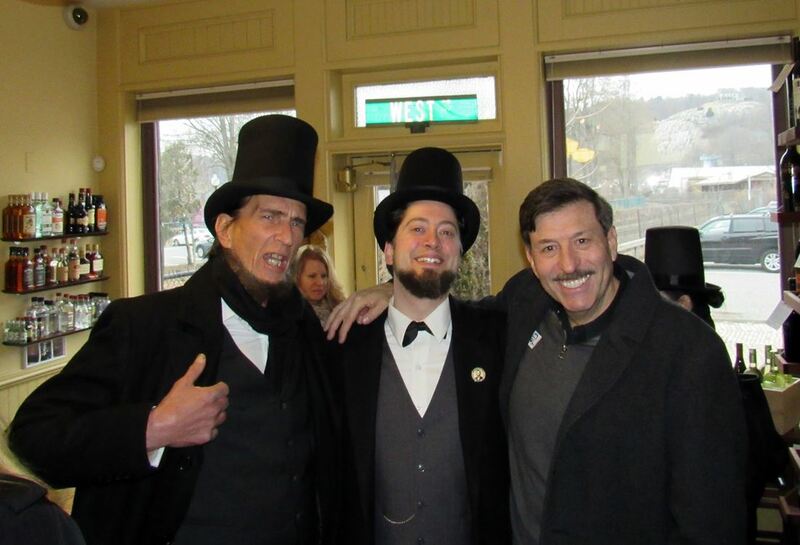 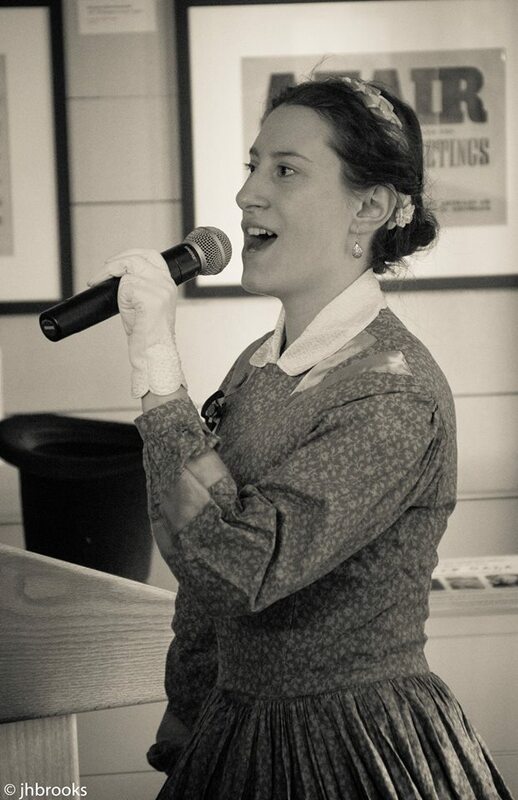 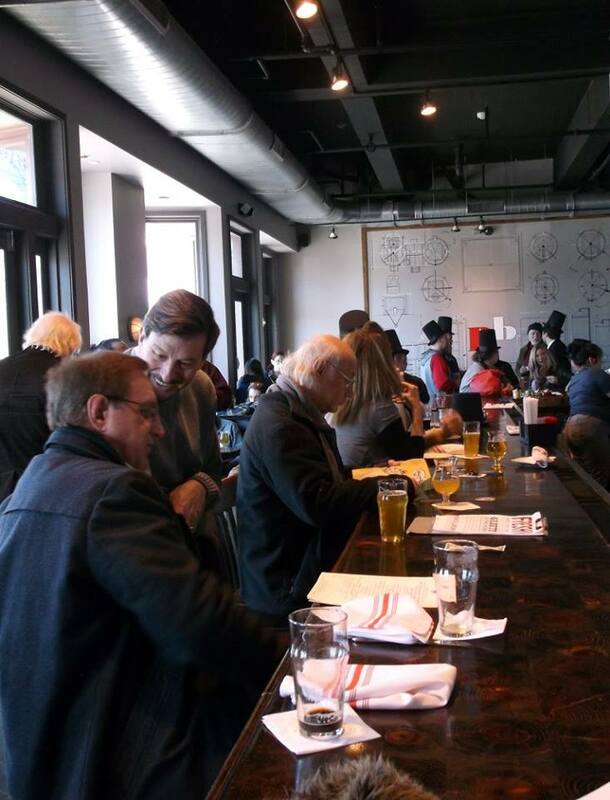 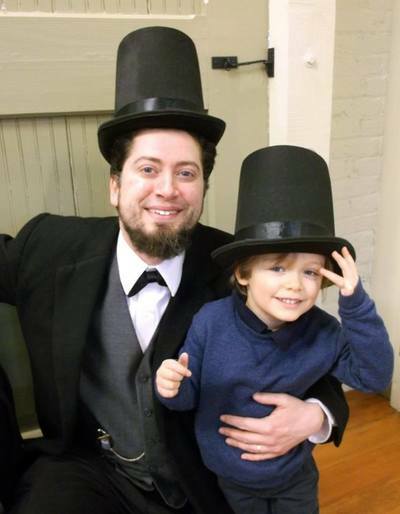 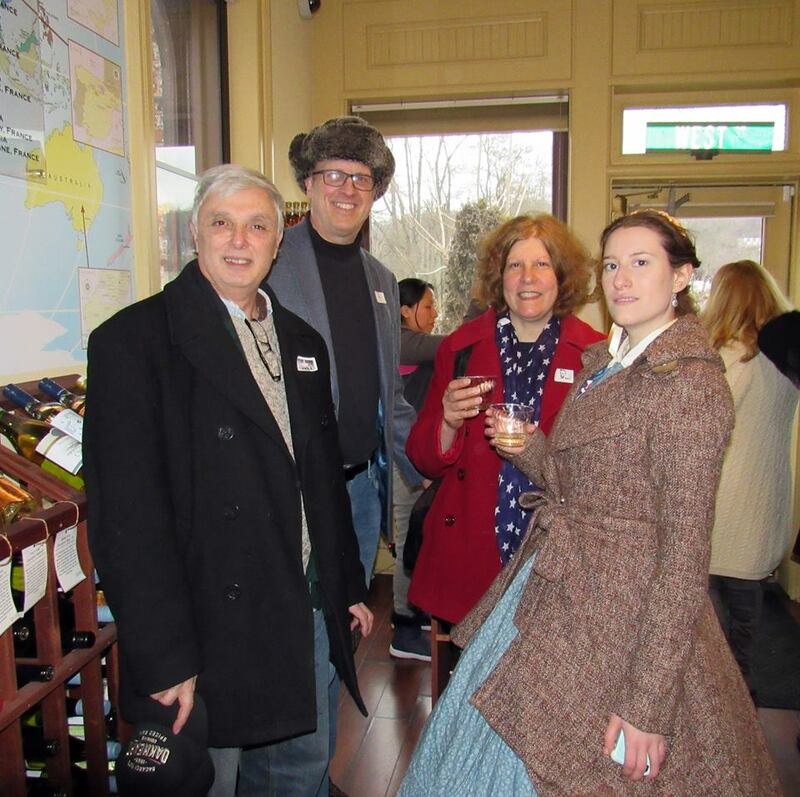 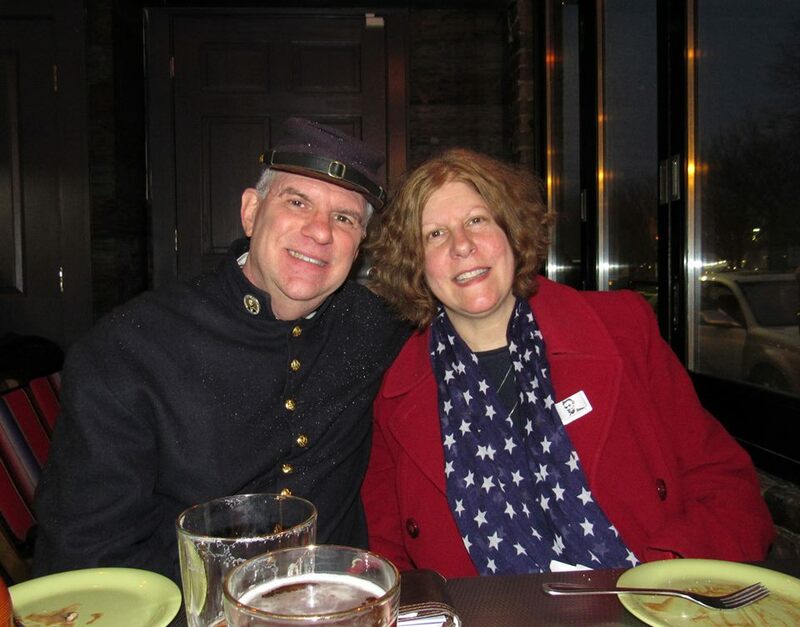 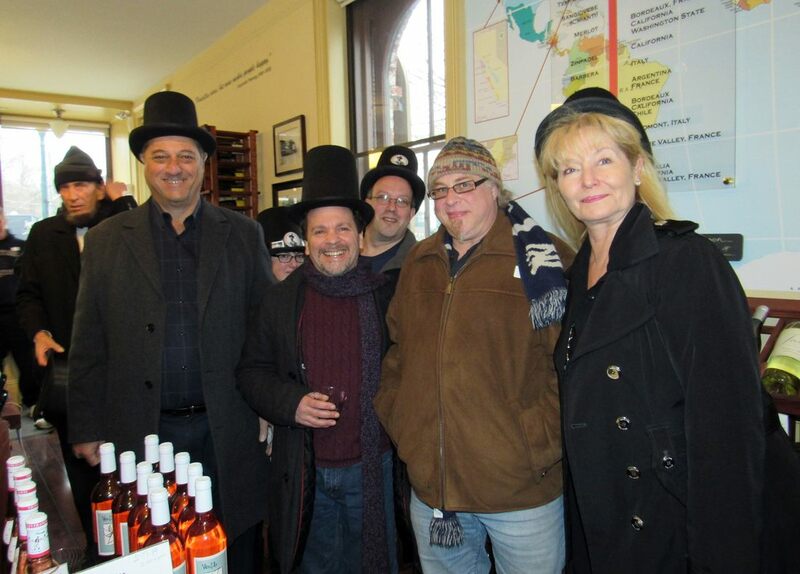 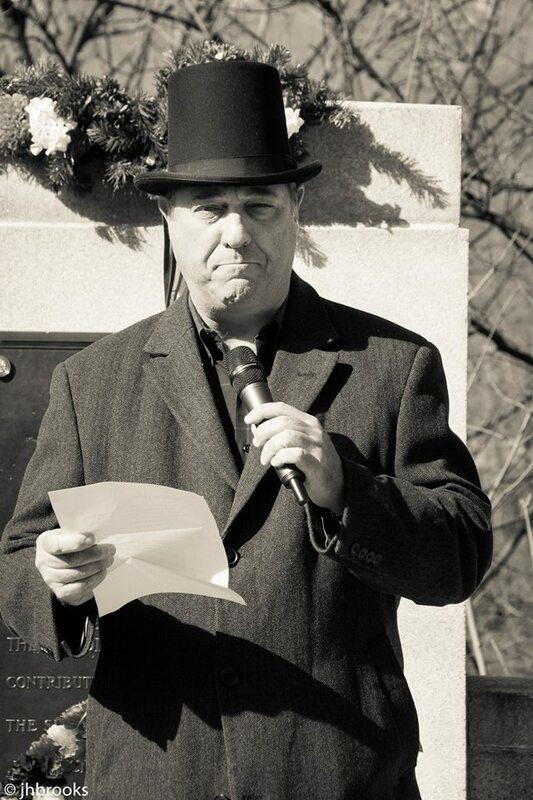 What a great day we had Saturday February 18 for the Lincoln Society in Peekskill and the Lincoln Depot Museum! 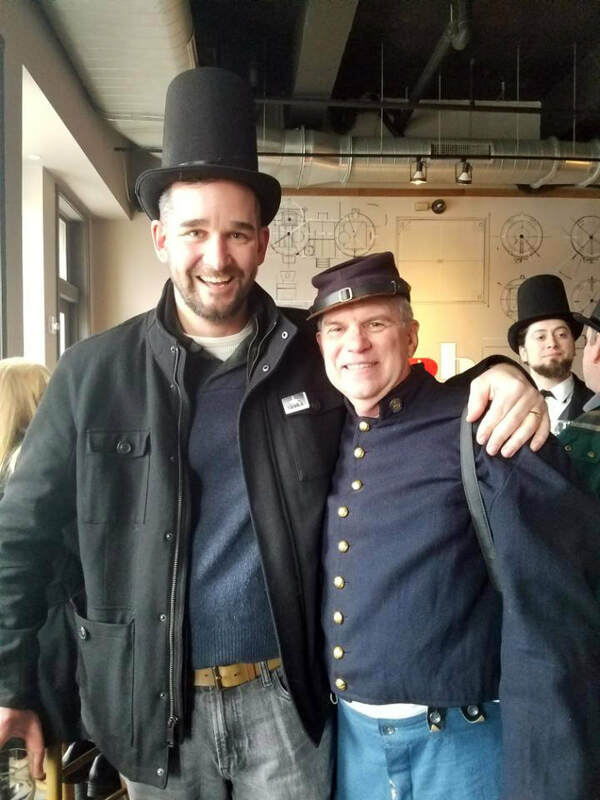 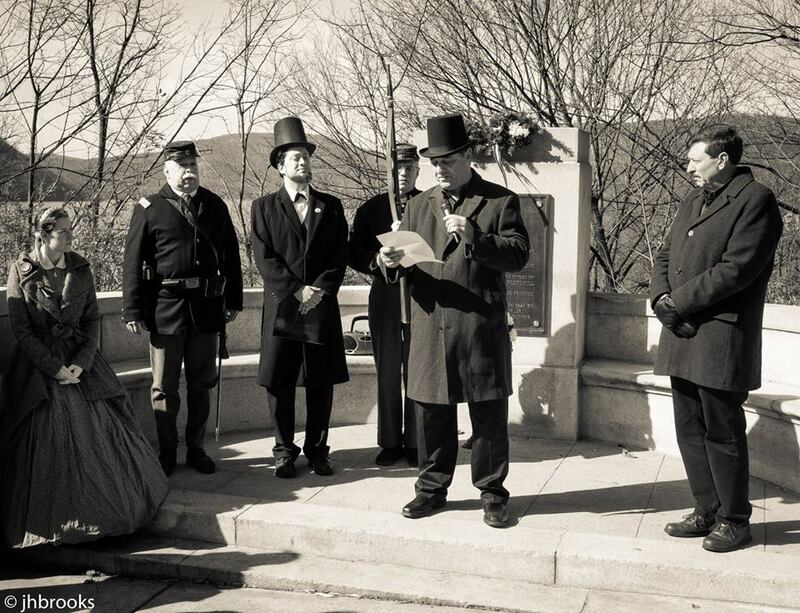 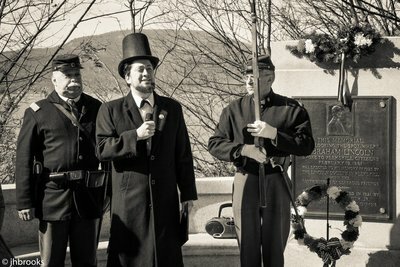 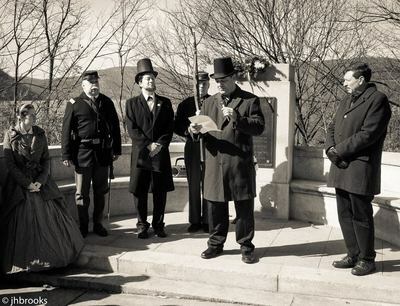 Began with our ceremony at the Lincoln Exedra on South Street and then a small parade to the Lincoln Depot Museum where we re-created Lincoln's February 19th, 1861 Speech there. 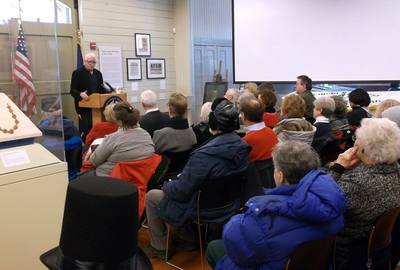 Refreshments and viewing of our Museum exhibits followed with a wonderful program by Prof Charles Strozier (standing room only). The whole event was attended by well over 100 citizens! 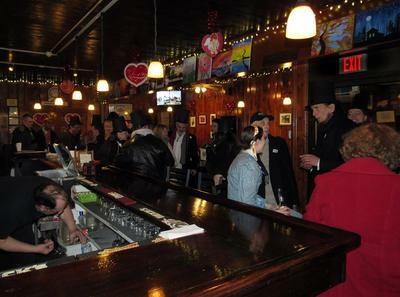 The hearty ones then proceeded across the street to the Peekskill Brewery to begin our much publicized LINCON Pub Crawl ("Drinkin with Linkin"). 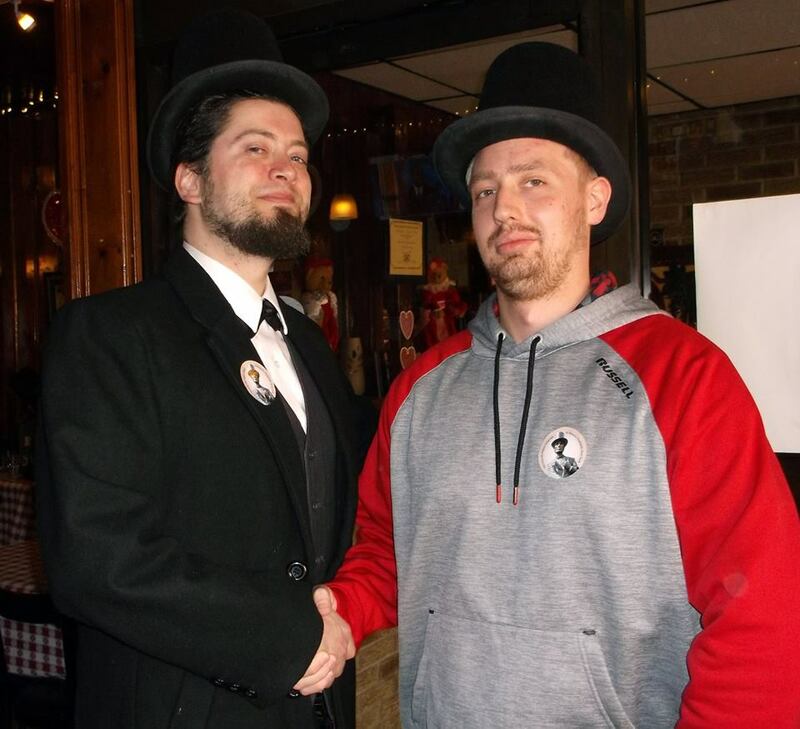 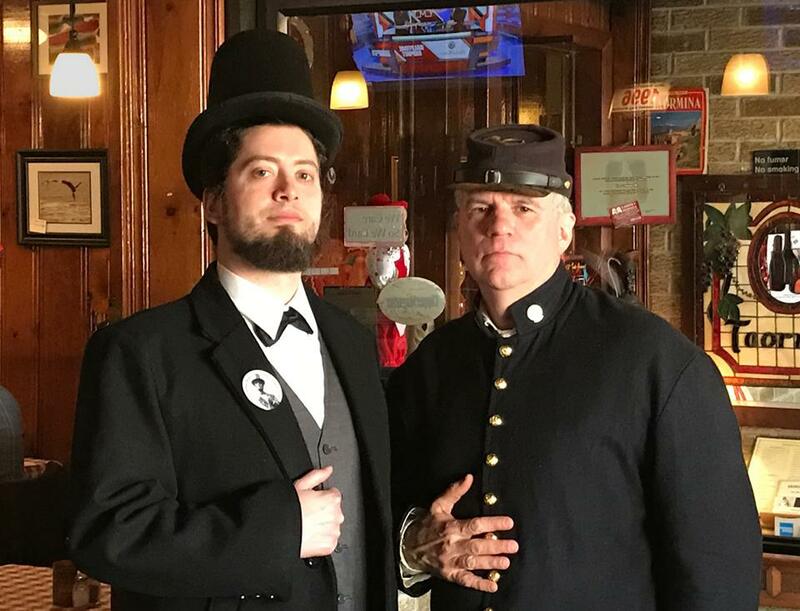 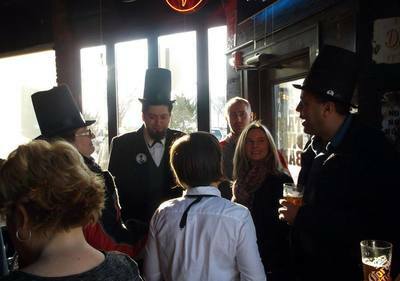 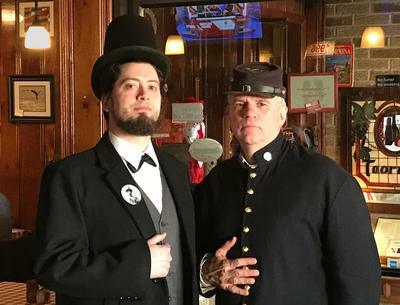 I was tasked with guarding our 16th President and protecting him throughout the day at the 5 different pubs on the tour! 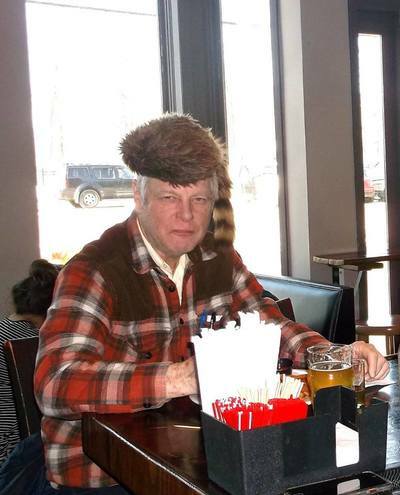 TOUGH DUTY! 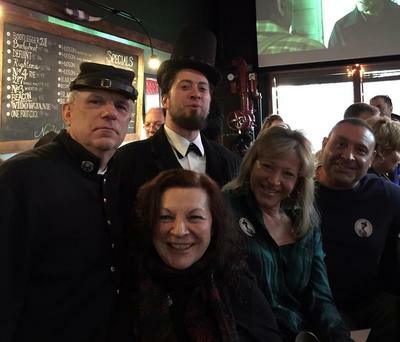 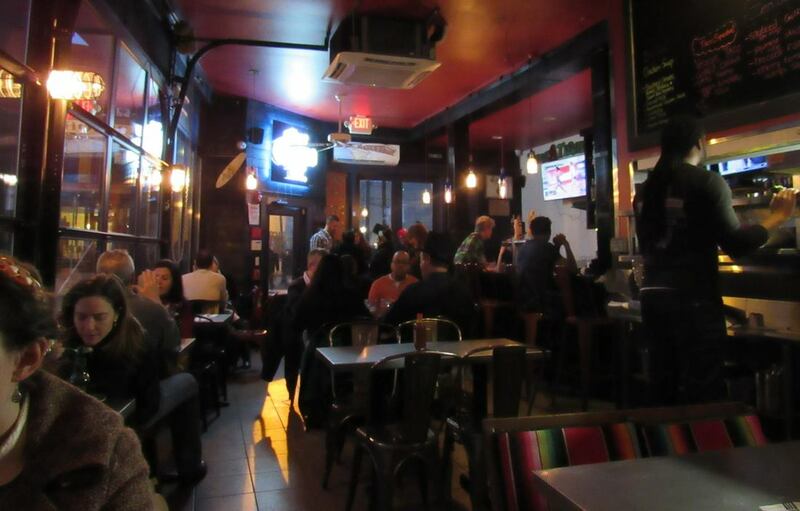 Our WORLD FAMOUS LINCON Pub Crawl, "Drinkin with Linkin"!